Does VMware Miss the Grade? Margins matter. The more VMware (NYSE: VMW) keeps of each buck it earns in revenue, the more money it has to invest in growth, fund new strategic plans, or (gasp!) distribute to shareholders. Healthy margins often separate pretenders from the best stocks in the market. That's why I check on my holdings' margins at least once a quarter. I'm looking for the absolute numbers, comparisons to sector peers and competitors, and any trend that may tell me how strong VMware’s competitive position could be. Over the past five years, gross margin peaked at 83.8% and averaged 83.0%. Operating margin peaked at 17.8% and averaged 15.6%. Net margin peaked at 16.5% and averaged 13.3%. TTM gross margin is 82.6%, 40 basis points worse than the five-year average. TTM operating margin is 15.6%, about the same as the five-year average. TTM net margin is 13.2%, 10 basis points worse than the five-year average. 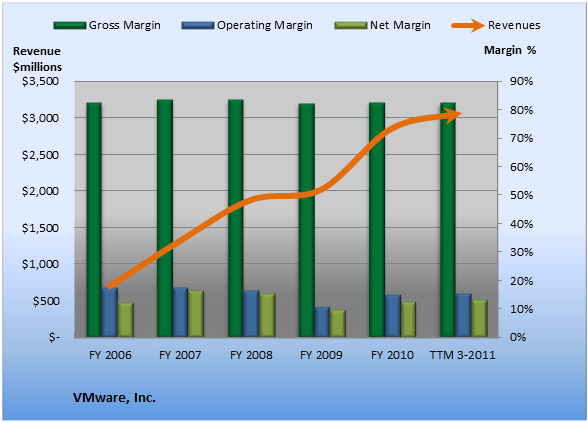 With recent TTM margins only slightly below historical averages, VMware looks like it is doing okay. Add CA Technologies to My Watchlist.